The Office of National Marine Sanctuaries serves as the trustee for a network of 14 marine protected areas encompassing more than 170,000 square miles of marine and Great Lakes waters from Washington state to the Florida Keys, and from Lake Huron to American Samoa. The network includes a system of 13 national marine sanctuaries and the Papahānaumokuākea Marine National Monument. citing "Executive Order 13547 --Stewardship of the Ocean, Our Coasts, and the Great Lakes"
"The expanded sanctuary area includes one of the most productive upwelling zones in North America — a process in which deeper, colder waters rise and replace surface water as it’s pushed away by the wind. 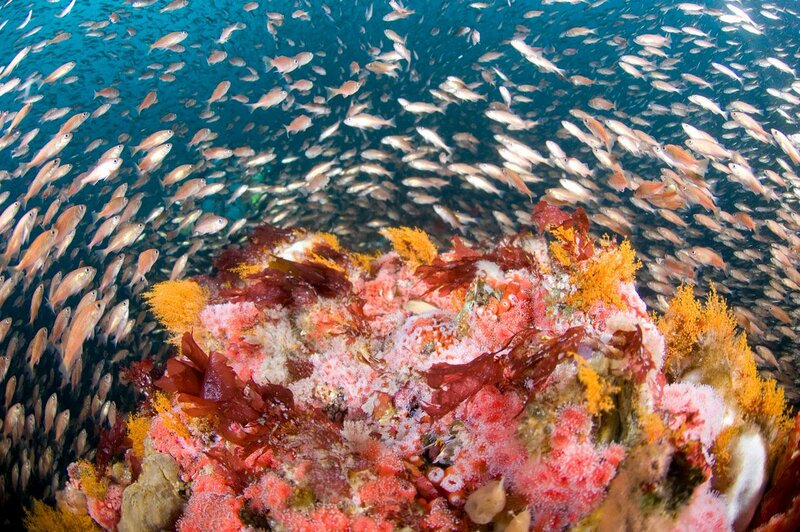 These colder waters are rich in nutrients and support an incredible abundance and diversity of marine life in a complex food web that is essential for commercially valuable fisheries, including red urchin, Dungeness crab, and salmon. These fisheries are an important part of local economies along the length of the North-central California coast. In addition to the numerous species of fish, endangered whales, seabirds, and extensive living reefs of corals and sponges all call the sanctuaries home."